Home › Uncategorised › Optimizing resource utilization – How Earned Value measurement helps. Optimizing resource utilization – How Earned Value measurement helps. Managing your multi-project workload with a limited pool of resources makes for an exciting ride. Whilst there must be sufficient spare resources on hand for emergencies, too many just sitting on the bench will quickly impact your utilization targets and can rapidly erode profitability. Indeed, the UK Association of Consulting Engineers found, in a recent survey, that if its members could increase resource utilization by just 2%, their annual profits would increase by more than 25%. So there is a rich financial reward for optimizing resource utilization! A major cause of poor utilization is when individual projects fail to achieve their early milestones dates. Estimates to complete and timescale plans must be revised; if these are unrealistic, the overall skills capacity plan may well not cope. Whilst it is easy for the project team to delude themselves that the early problems have been overcome and that everything is miraculously back on track, sceptical managers should need convincing. They should be assessing what the remaining estimate would be if the actual levels of performance do not improve. Without this test, the drive towards optimizing resource utilization will fail. Earned value measurement brings clarity and common sense to these fraught situations. As soon as the project’s plan and estimate are agreed, a snapshot should be taken, so that there a timephased baseline against which performance can be measured. The amount of effort expended can be recorded using timesheets, but it is meaningless just to compare this against the plan, without measuring what’s actually been achieved. Earned value measurement techniques provide an objective means of assessing the value of what’s been achieved. It is only when this is compared with the project baseline, and the amount of effort expended, that an objective picture of project performance can emerge. 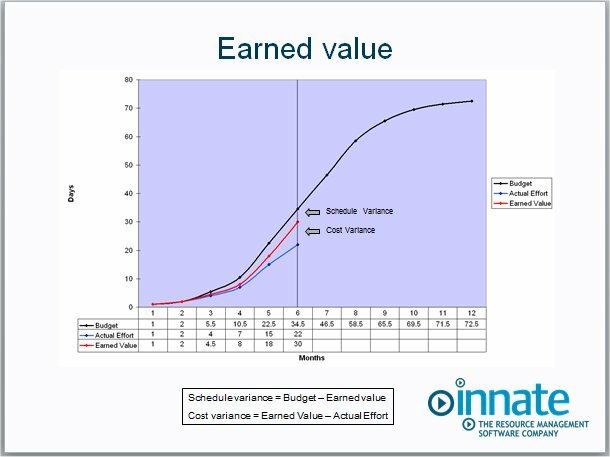 In the above example, the Actual effort is below what’s expected in the plan, but the Earned value curve shows that what’s been achieved is also well behind what’s expected by month 6. Alarmingly, it is also below the Actual effort, showing that the original estimate looks over optimistic in both timescale and level of effort. 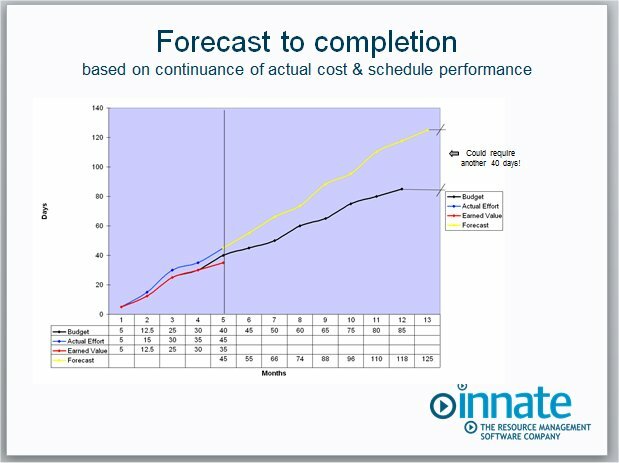 The diagram shows how these two elements can be calculated as cost and schedule variances to date. So, whilst the optimistic project manager may argue that all is now back on track, his boss can hold him to account by calculating the estimated costs and timescales to completion, assuming that there is no improvement in actual project performance. The Forecast to completion line shows just how bad this really could be. Unless there is a significant improvement in performance on this project, a cost overrun of up to 40 days and a 1 month delay are to be expected. This simple example shows how Earned value measurement can bring objectivity to each project’s monthly performance review. Only when every project’s forecast to completion becomes realistic can the required resource plans be made with confidence. Without this, target resource utilization levels are unlikely to be met.